Augmented reality (AR) enhances the way we see, hear and feel by bringing elements of the virtual world into the real world. Many people associate augmented and virtual reality with the gaming industry, but the technology offers far more than entertainment for a niche group. Industry forecasters predict that by 2020 the market worth for AR will reach $100 billion (€83.41 billion). 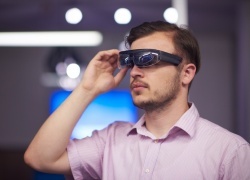 Moreover, analysts predict that the enterprise AR market will lead the consumer market, driven by the need to improve safety, productivity and efficiency, says Manuel Grenacher, CEO of Coresystems. The continued growth of the Internet of Things (IoT) introduces new complications and headaches to various industries. The field service industry, which will grow to a $5 billion (€4.17 billion) market by 2020, is one example. The real-time connectivity of the IoT in a mobile-first world has conditioned customers to expect faster service than ever before, putting pressure on technicians who rely on traditional service methods for issue detection, such as phone calls and/or service tickets. In addition, as the IoT continues to grow and become more complex, the industry develops a greater need for service technicians with more technological expertise than ever before. Thus, there are fewer expert technicians who can meet customers’ growing expectations with more complex issues, leading to longer travel and wait times. To remedy this, the field service industry is becoming an early adopter of AR technologies to keep up with this new level of improved capacity, ability and performance. Per a study by the Service Council, 68% of respondents attributed the increasing complexity of service products as a driving trend toward AR solutions. Two key drivers for an optimal field service experience are first-time fix rate and duration of onsite visits, and the industry has a lot to gain by integrating new AR innovations into its business strategy. One way AR will help service technicians is with the camera of their smartphone. A technician connects to the customer’s smartphone camera via an app. The technician can then see the issue through the customer’s camera and walk the customer through issue detection and possible solutions. This greatly reduces onsite visit times, as the technician now has a better understanding of the issue at hand. Another benefit to the app is when a technician is needed onsite, the app (through GPS functions) can notify the user of the status of their request and location of their technician. This ability to be constantly updated on the status of your ticket can really put a user’s mind at ease and by meeting real-time expectations. The second way AR helps onsite service is with AR glasses and their ability to reduce training time for junior technicians. A less experienced technician can perform onsite tasks with the more skilled technician behind the wheel, providing real-time visual guidance for the onsite technician. Normally, a highly skilled technician can only visit a specific number of clients a day. However, by remotely connecting these expert technicians to remote worksites, field service companies can handle multiple clients without travel time, increasing the number of clients they can support in a day and reducing overall cost of the service. By combining the latest advancements in video and augmented reality functionalities, customers can expect faster issue detection and problem resolution from start to finish, resulting in better customer satisfaction, experience and loyalty overall.